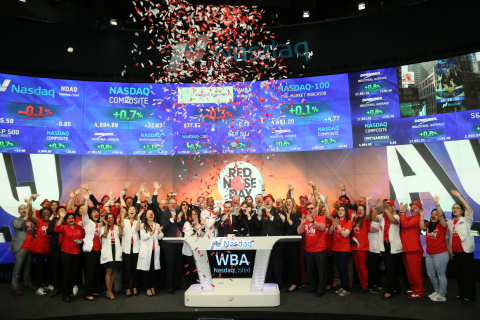 DEERFIELD, Ill.--(BUSINESS WIRE)--Walgreens Boots Alliance, Inc. (Nasdaq: WBA), the first global pharmacy-led, health and wellbeing enterprise, rang the Opening Bell this morning at the Nasdaq Stock Market in celebration of Walgreens participation in Red Nose Day. Walgreens, one of the nation's largest drugstore chains, is included in the Retail Pharmacy USA Division of Walgreens Boots Alliance. Red Nose Day, which is happening today in the U.S., is a chance for everyone to get seriously silly to raise funds and help change the lives of kids who need it most – in the U.S. and around the world. Over the past several weeks and continuing through next week, Walgreens has asked its customers to purchase red noses and other red flair items and wear them today on Red Nose Day, with proceeds benefiting the Red Nose Day Fund. In honor of the day, Walgreens Corporate Operations Vice President Skip Bourdo and Christy Gibb of the Comic Relief Board of Trustees rang the Opening Bell. Representatives from Red Nose Day 2016 partners NBCUniversal and Mars Chocolate North America also were in attendance. “We’ve already raised millions of dollars for this year’s event, thanks to our valued customers, supplier partners and particularly our passionate team members who all took advantage of a chance to get seriously silly during this powerful campaign,” said Bourdo. This year’s Red Nose Day campaign will culminate tonight in a live, two-hour broadcast on NBC from 9-11 p.m. Eastern time. The television special will feature popular comedians, top musicians and Hollywood stars in an engaging mix of comedy, live musical performances and short, compelling films shedding light on the cause. Through the power of entertainment, Red Nose Day raises awareness and money to help kids who need it most at home and around the world. Red Nose Day, in its second year in the U.S., has raised over $1 billion globally in the last 25 years. Continuing through June 4, Walgreens and Duane Reade locations throughout the U.S. will continue to sell red noses for $1 each and red flair items for between $1-$5.99. Proceeds from red nose and red flair purchases benefit the Red Nose Day Fund***, which supports charities with domestic and international reach aimed at fighting childhood poverty, including Boys & Girls Clubs of America; charity:water; Children’s Health Fund; Covenant House; Feeding America; Gavi, The Vaccine Alliance; National Council of La Raza; National Urban League; Oxfam America; Save the Children; and The Global Fund. Walgreens Boots Alliance is the largest retail pharmacy, health and daily living destination in the USA and Europe and, together with its equity method investments*, employs more than 370,000* people and has a presence in more than 25* countries. Walgreens Boots Alliance is a global leader in pharmacy-led, health and wellbeing retail with over 13,100* stores in 11* countries. The company includes one of the largest global pharmaceutical wholesale and distribution networks with over 350* distribution centers delivering to more than 200,000** pharmacies, doctors, health centers and hospitals each year in 19* countries. In addition, Walgreens Boots Alliance is one of the world’s largest purchasers of prescription drugs and many other health and wellbeing products. Red Nose Day (rednoseday.org) is a fundraising campaign run by the non-profit organization Comic Relief Inc. (comicrelief.org), a registered 501(c)(3) public charity. Red Nose Day has raised over $1 billion globally in the last 25 years, and in the UK has become a cultural phenomenon where people across the country come together to have fun, raise money and change lives. Red Nose Day launched in the U.S. in 2015, dedicated to raising money to help children who are most in need, both in the U.S. and in some of the poorest communities in the world. Last year it benefited children and young people in all 50 states and in 15 countries internationally. Red Nose Day returns this year on 26 May 2016. The day's events will culminate in a two-hour live primetime TV special on NBC, featuring the biggest stars across comedy, music, TV and film. Funds raised go to the Red Nose Day Fund which distributes the money through programs to keep children and young people safe, healthy and educated. Comic Relief Inc. in the US and Comic Relief UK are independent sister organizations that are joined by their shared vision of a just world, free from poverty and the mission to drive positive change through the power of entertainment. *** Until June 4, 2016, for each Red Nose purchased Walgreens will donate $0.50; and for each Red Nose Flair item purchased (Beads, Bow Ties, Headbands, Sunglasses, Pens, Mugs, Cups and Hats) Walgreens will donate 10 percent of the purchase price to Comic Relief Inc.'s Red Nose Day Fund, which helps lift children out of poverty in the U.S. and overseas. For more information about the Red Nose Day Fund, visit rednoseday.org. No portion of purchase is tax deductible.